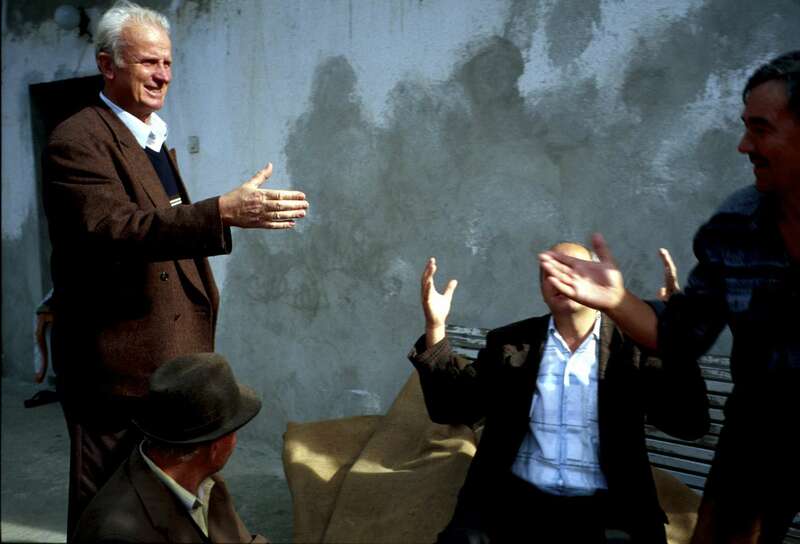 Muslims and Serbs who have remained friends greet each other in the town of Srebrenica. The Muslims have not yet returned to live in the town, but one man -- whose father and brother were killed by Serbs in the 1995 massacre -- praised his Serb friend, a former colleague of his father\'s. The Serb had helped look out for the Muslim\'s home after the end of the war. \"This man did not kill my father,\" said the Muslim (seated on the bench in the photo). \"If I met the man who did kill them, that would be a different story.\" October 2000.